High above Baku, close to the Parliament Building, sits a graveyard full of history, memories and complications. Indeed, Azerbaijan has an incredibly complicated history, aided by the mix of religions in the area and Azerbaijan’s precious resource of oil. The end of World War I, the Russian Revolution and the ensuing Russian Civil War brought turmoil to Azerbaijan. In March 2018 a fierce battle erupted in Baku, with Russians and Armenians moving to quell the Azerbaijanis. Three days of inter-ethnic warfare took place, resulting in the massacre of up to 12,000 Azerbaijanis. Most of those Azerbaijanis who survived these March Days fled to Persia. Many of the dead were buried in the graveyard above Baku. The struggles continued, and the exiled Azerbaijanis were able to return in May 1918, when the short-lived Azerbaijan Democratic Republic established itself. This period only lasted until April 1920: the Russians missed the oil and their dominance, and moved back in, with another 20,000 Azerbaijanis dying in this Russian reconquest. Azerbaijan now became the Sovet Sosialist Respublikaları İttifaqı, part of the Soviet Union, which lasted from 1922 to 1991. As the Soviet Union came towards the end, violence grew again in Azerbaijan, mainly between Azerbaijanis and Armenians. In 1988 the Armenians of Nagorno-Karabakh, an ethnic Armenian enclave that was part of Soviet Azerbaijan, became vocal in their desire for unification with Armenia. Although Gorbachev denied their request, Soviet Armenia continued to claim possession and war broke out between Nagorno-Karabakh and Azerbaijan. This encouraged many Azerbaijanis to push for independence and exit from the USSR. The antagonism between the the two nationalities, and religions, escalated. Azerbaijanis and Muslim Kurds fled from Nagorno Karabakh, and Armenians left Azerbaijan. Confusion and anger led to rallies on the streets of Baku in January 1990, and violence ruled for 5 days. Those Armenians still living there were “encouraged to leave”, with many injured and killed. The USSR declared a state of emergency in Baku, and on 20 January Soviet forces entered Baku. Many Azerbaijanis died. Almost the whole population of Baku turned out to bury the dead of Black Saturday on 22 January 1990, followed by 40 days of mourning and mass protest, including refusal to work. A government decree in December 1999, all victims of the crackdown were awarded the honorary title of “Martyr of January 20”. My brevity failed in telling that history, but now back to the story of the graveyard. During the days of the USSR, the Russians decided to excavate the cemetery, removing all of the bodies, and converted the area into an amusing park known as Kirov Park, named after the Bolshevik leader Sergei Kirov, and containing a monument to him. 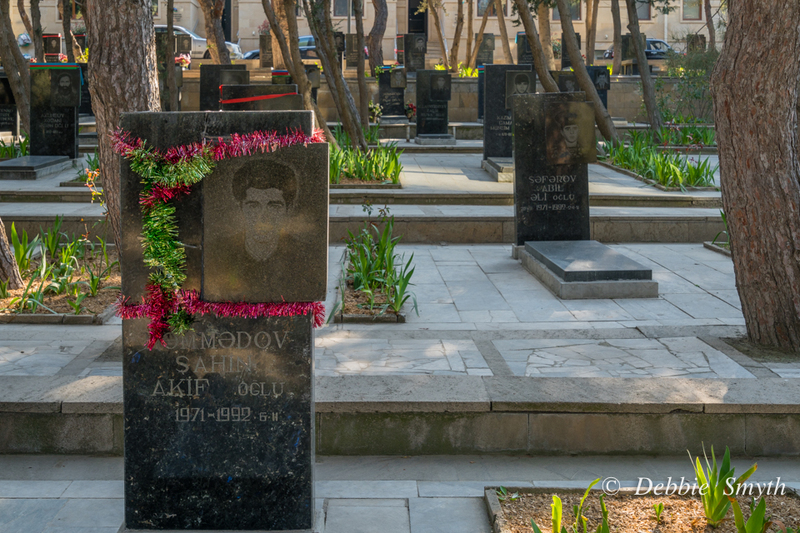 With the fall of the Soviet Union in 1991 and Azerbaijan’s renewed independence, the park was removed and an area was allocated for the burial of the victims of Black January. 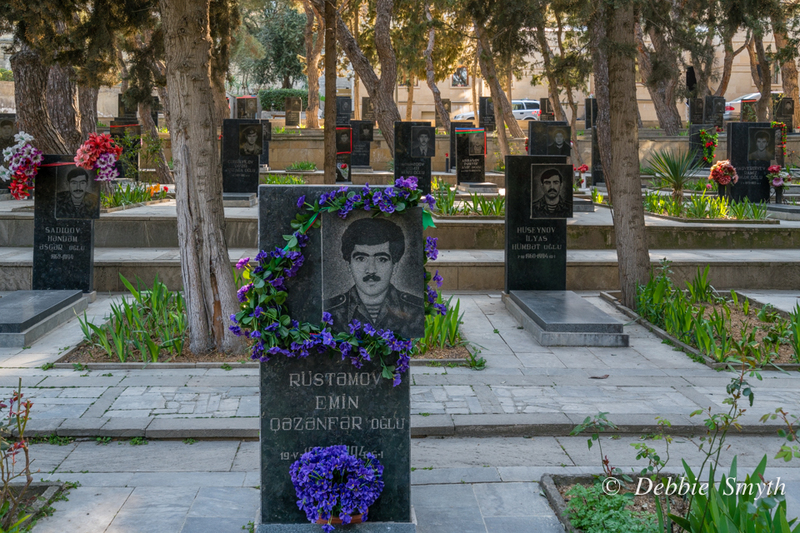 The cemetery has since been expanded to include prominent Azerbaijani leaders and political figures, as well as fighters who fell during the Nagorny Karabakh hostilities. I would love to run this post in our e-newsletter. It goes to about 2,500 people. Would that be OK? For info on us: http://www.gravestonestudies.org. Thank you. Yes, I would be honoured to be included, as long as I am shown as author. Thanks! You will have full credit, on the enews and the link. Interesting – relations between Armenia and Azerbaijan are no better now though. Terrific post for this week. Thanks Debbie.